Plant seeds from spring to early summer. Soya beans must have warm soil to germinate and grow. Poke holes into a cultivated bed or row to plant soybean seeds about 5 cm (2in) apart and 1 cm (1/2in) deep. Thin to 15 cm (6in) apart in all directions. Chop down or pull up plants just as they begin to flower if you wish to use as green manure. Nitrogen nodules left behind in the soil add fertility. 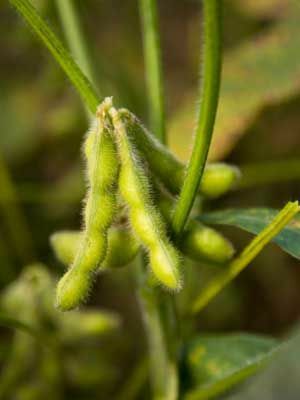 Soya Beans for consumption should be harvested when pods have filled but are still green.